We’ve been paying for Hulu Plus for a year now – we really enjoy the TV shows and movies they have online – but it’s hard to watch shows as a family because it’s just not comfortable gathering around the computer desk. What we needed was a way to get the video services we were already paying for to the big flat screen TV in the family room where everyone could enjoy them. After a little internet research I was surprised to discover it’s really pretty easy to do. All you need is a media server – a software solution running on your PC – that feeds the services you already have to your TV through your game console, Logitech Revue Companion Box, or directly through your internet ready TV. 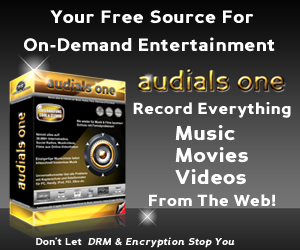 There are also iPad, iPhone and Android apps to stream to your phone and portable devices. You can also stream the video files you already have on your PC through the media server to the same devices. I was a little worried the initial set-up would be difficult but was there was nothing to it – and I mean nothing. It installed and automatically all the devices were found. The final configuration only took a couple on minutes and I haven’t had to touch it since! I can watch all my favorite TV shows and movies from our Hulu, Netflix, and Amazon accounts on my HTC Thunderbolt smartphone at work during lunch, when we travel, or when I’m stuck somewhere and have some time to kill. The PlayOn home media server is a program that allows you to stream videos and movies from your computer and many of your favorite websites (such as Netflix, Hulu, and Amazon) to any of your other internet capable devices (like your smartphone or gaming console). It’s not free but the cost is really reasonable and they have three payment options that should work for just about anybody – a low month-by-month plan, an annual fee, or a one-time fee where you never pay anything again no matter how much or how long you use it. You can download the free trial by clicking here. A good internet connection. If you’re already streaming video to your PC it’s clearly good enough! A home network – wireless or Ethernet. Someplace to watch it. A comfy family room will do quite nicely. A TV hooked up to a gaming console (xBox 360, PS3, Wii). A Smartphone with the free PlayOn app installed. Remember earlier when I said there was nothing to setting it up? Playstation 3 – Check the video menu and you’ll see PlayOn listed along with the name of your PC. Select it and you’ll jump to the menu. Select the “channel” you want to watch and you’re ready select the show you want to watch. Xbox 360 – Go to the Video Library inthe “My Xbox” menu. PlayOn will be listed along with the name of your PC. Select it and you go to the menu. Select your channel and, again, you’re all you’re ready to go. Wii – Navigate to the Internet Channel and enter “playon.tv” in the address bar. You’ll see the list of channels and you can easily navigate through them to find the TV shows and movies you want to stream. If you don’t already have the Internet Channel set up on your Wii it’s a free download from the Wii Shop Channel. iPhone/iPad – Go to the App Store and download the free Mobile app. Be sure that PlayOn is running on your PC and launch the app on your phone while you’re on the same Wi-Fi network as your PC. You’ll see your copy of PlayOn listed on your iPhone screen. Select PlayOn and you’ll see the menu of channels. Once your phone is “paired” to your PC you should now be able to watch your streaming media anywhere over Wi-Fi or your 3G connection. Confirm that Enable Mobile Access is selected in the PlayOn Settings on your computer. Android Phone – Install the Mobile app from the Android Market. While PlayOn is running on your PC, open the app on your device. Again, make sure that you are connected to the same Wi-Fi network as your PC. Next, “pair” your device with your PC. On the first screen of the app, you’ll see your copy of PlayOn listed and it will have the same name as your PC. Select your PC and then a menu of channels will appear. Now that your device is “paired” with your PC, you will now be able to watch your streaming media anywhere, either over any Wi-Fi connection or your 3G phone connection. Confirm that Enable Mobile Access is selected in the PlayOn Settings on your computer. It also works on many DLNA-compliant set-top boxes. Take a look a the supported devices list on PlayOn’s website for details. Also, find out how to record Netflix, Hulu, and Amazon to your PC. If you have any questions please leave a comment below. 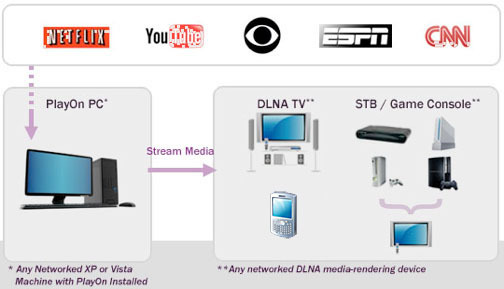 I hope this helps you get the most out of the internet streaming services your already paying for.